Although associations are united by a common interest or mission, active engagement and growth are needed for the group to thrive and grow. 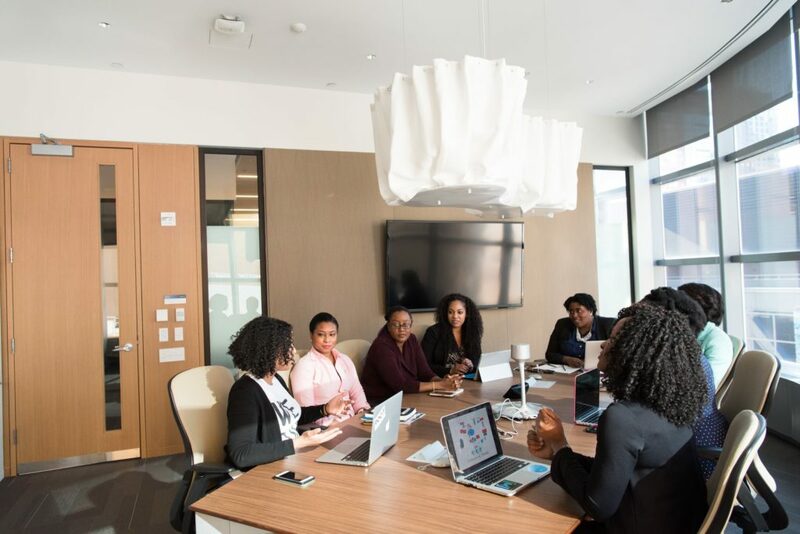 Although it’s not always easy to do, an association needs cutting-edge strategy, the latest technology, and budget in order successfully retain members. Committed and happy members enable the organization to succeed and find new participants. But what is the key to gaining new members and retaining existing ones? 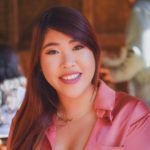 Easier said than done, providing an excellent membership experience incentivizes membership retention, organic growth through referrals, and attracts the attention of new prospects! In the age of mobile, thinking outside the box and moving away from traditional played-out methods is necessary. With digital processes affecting the way we work, play, and socialize, it’s time to give flyers on a corkboard the boot and utilize mobile technology! Data from analytics firm, Flurry, found that U.S. users spend up to five hours on their smartphone — that’s a 69% increase year-over-year! Apps account for 89% of mobile device time and provide the perfect opportunity to reach people where they already spend time! A mobile app is conveniently accessible for users no matter where they are or what time it is during the day. Going mobile is also green-friendly, saving green from your wallet and green resources as the need for printing wasteful resources will be eliminated. The power of mobile can be limitless; here are a few examples of the best use cases for association apps. Providing a mobile app for an event gives attendees an invaluable, accessible resource. Many associations host small and large events, sometimes several times a year. Some of these events may include annual conferences, regional events, weekly meetups, and leadership or training workshops. Speaker Information. People travel far and wide to hear the words of a speaker they highly respect. Or, perhaps the event is the first introduction they have of the person, and after listening to what they had to say, they need to learn more! Provide speaker information to create excitement and give the attendees an idea of what they’re in for. Maps. It’s unlikely that all of the attendees will have the venue memorized like the back of their hand. Provide interactive maps to ensure that members can find their sessions quickly, easy, and painlessly. No need to worry about anyone getting lost! Agenda. When attending an event, people want to make the most of their short time there and are usually running back and forth trying to fit it all in! Providing an agenda allows attendees to plan out their days accordingly, keeping them physically and mentally prepared and on-track! PDFs and Content. Attendees can look back on presented material without carrying wasteful paper around. It’s unlikely that attendees will hold onto paper handouts forever, so make sure to upload PDFs from speaker sessions, forms, or any other helpful material! Hotel and Location Information. It’s all about the location! Provide details of the hotel, such as room assignments and parking to make your member’s stay at an event all the more enjoyable. Surveys and Polls. It’s not always easy to solicit feedback from busy individuals, but a mobile app provides an easy way for attendees to give feedback and an easy way for organizers to receive feedback. Send surveys and polls straight to an attendee’s phone so they can complete it on their own time without scrambling for a pencil. Gain beneficial feedback to improve future events! Member Handbook. As with all groups, there’s probably a set of rules, regulations, or policies that hold everything together! Upload a digital version of your association’s handbook for easy access. You can make updates at any time. Regional Info. United under one purpose, passion, or goal, your association may span over world! List your different regional sections and show some pride. Calendar. When’s the next meeting? Provide a calendar of all those meetings and events that groups worked so hard to organize. Push Notifications. Sudden news? Updates? A friendly reminder? You can send push notifications to a user’s phone, even if the app isn’t open. Contact. No one likes a wild goose chase when they’re looking for a real human to talk to. Provide relevant contact information for your association’s chapters. Inbox. Efficiently reach your members with the app’s messaging feature! Members can message and communicate with each other via inboxes or post on a social-style feed. 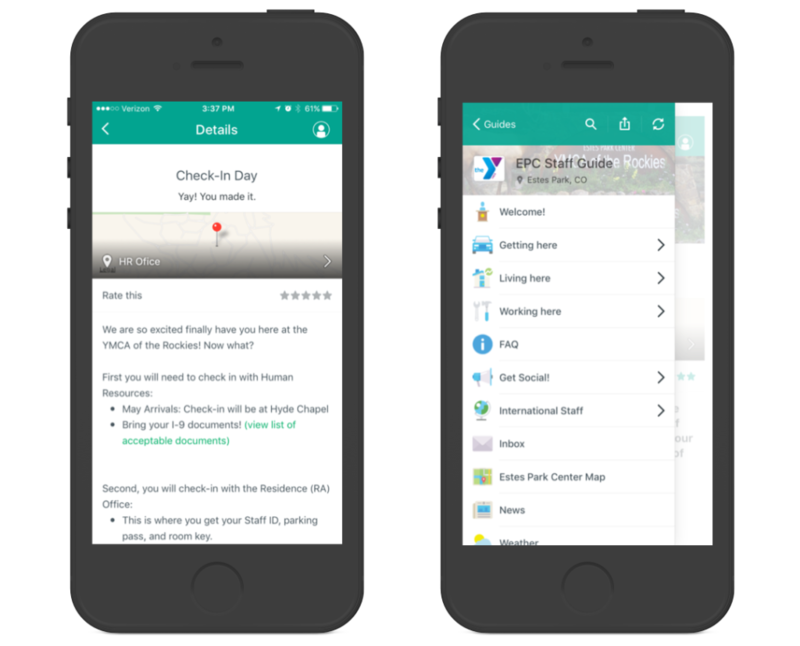 YMCA of the Rockies uses Guidebook to improve communication with more than 800 seasonal staff. Instead of messages getting lost in the inbox, important information such as plans and diets are relayed via mobile! They use Guidebook to organize their staff to successfully provide fun activities throughout the year for their community. 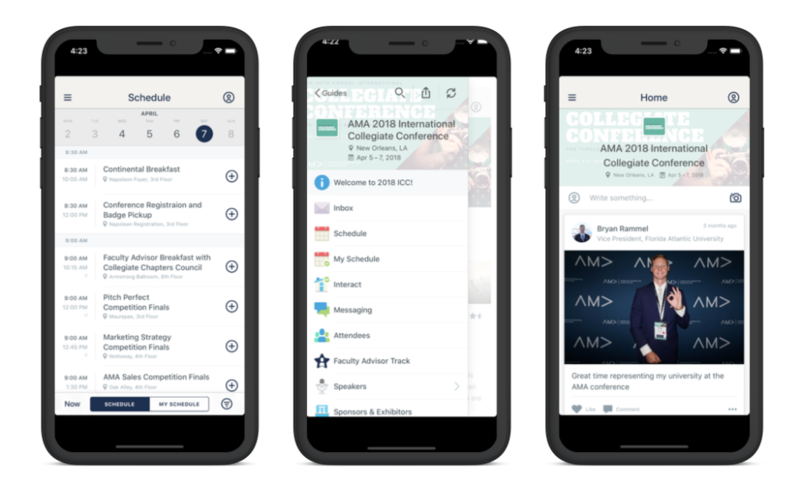 The American Marketing Association, a professional association for marketing professionals with over 30,000 members and 250 collegiate chapters across the U.S., takes advantage of mobile technology for their various events. Let’s take a look at the guide for their 2018 International Collegiate Conference. 1,170 attendees downloaded the guide. 6.3 guide sessions per user meaning they used it several times during the conference! 83.2 seconds average per session demonstrates that guests were actively engaging with the app. Want to see how easy it is to build an app using Guidebook’s platform? Click the button below to try it out!